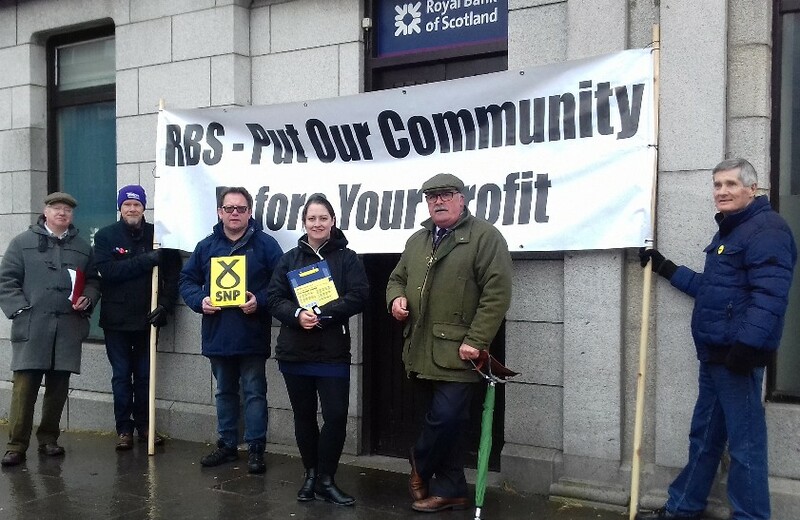 The local campaign against the RBS closures continued this weekend in Huntly, with campaigners out to collect more signatures for the petition. The campaign has been underway for several months, and has gathered significant numbers of signatures from Banff, Turriff, Stonehaven, Ellon and Huntly. Following pressure from the SNP group at Westminster, RBS announced that some of the branches earmarked for closure would remain open, however none of those in Aberdeenshire were included in this list. The Economy, Jobs and Fair Work committee at the Scottish Parliament will now also consider this matter. The Aberdeenshire Councillors who are campaigning on this issue plan to be in Edinburgh during the RBS AGM in May to campaing outside, and to hand over the petitions. 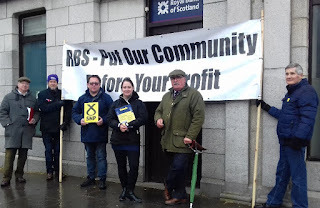 “There continues to be significant concern locally about the planned closure of the RBS. Not only does it mean that customers of the bank will now have to travel a significant distance when they require banking services, but it will also add to the continuing decline of our town centre. “RBS have said that the mobile banking van will visit the town twice a week, but will park on the outskirts, instead of travelling in to the town centre. The van already has accessibility issues – these will only be exacerbated by it being parked so far out of the town centre. “The RBS banks have been at the heart of our communities for many a decade. Our communities rely on the service they provide, yet in the name of profit that heart is to be ripped out. “It is incomprehensible that at a time when the top executives receive millions of pounds in bonus’ each and sport receives millions in sponsorship from RBS, a fraction of that cost is to be saved depriving our communities of a banking service that the community has been loyal to and rely on.